Scottish Life Sciences Award Winners 2019! 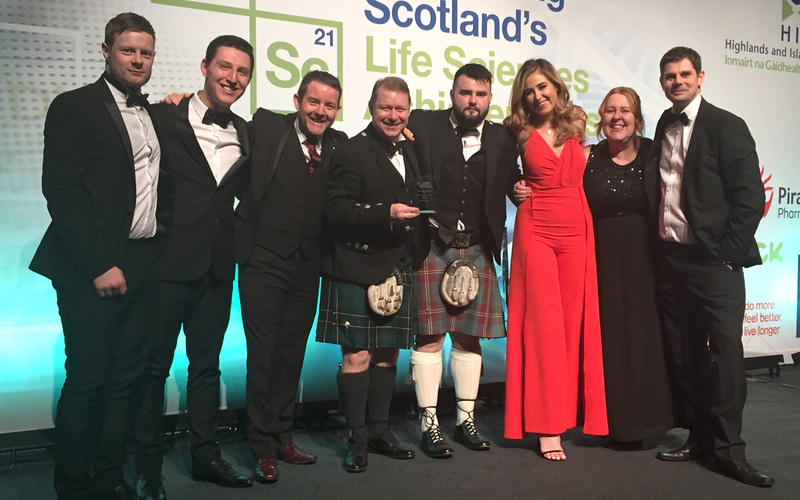 We are honoured and proud to have won the Rising Star: High Growth Company Award at Scotland’s Life Sciences Dinner and Annual Awards. Left to Right: Peter Scott, Lewis Carson, Kevin Fallon, David Barlow, Tom Hutchison, Cara Donnelly, Michelle Armstrong and Murray Whyte. The high growth award celebrates a Scottish SME life sciences company that has seen significant growth in revenue and profitability through strong organic development, with a robust development strategy in place to build on current successes in the years ahead. It’s a fantastic feeling to be recognised for this award and a nice pat on back for all the team members here at FlexMedical Solutions, we celebrated in style enjoying a wonderful evening in Edinburgh. Our night at the Scotland’s Life Sciences Dinner and Annual Awards left us feeling inspired and proud at what life sciences companies within Scotland are achieving, truly putting our ‘wee’ country on the map. It’s been a busy and challenging year so far, but all the hard work has been more than worth it. Huge congratulations to all the other winners, hope you all had as fantastic a time as we did!